I'm a sucker for anything chocolate peanut butter, and every year on my birthday, Laurie makes me a different chocolate and peanut butter themed dessert. This was from this year's birthday--unbelievable chocolate peanut butter cupcakes. They were chocolate cupcakes with a peanut butter cream filling, chocolate buttercream frosting, and a Reese's peanut butter cup on top. They were terrific and very filling with a perfect combination of chocolate and peanut butter. This was a simple chocolate cake batter scooped into the cupcake cups with an ice cream scoop. The filling was whipped peanut butter folded into whipped cream, which was piped into each cupcake. The frosting was very light and more mousse-like then thick. I liked to top a cake or cupcake with something which reflects what is inside, so these are toped with peanut butter cups. Father's Day, Graduation, and Birthday Cake in One! This was a tricky cake. We were getting together with some of Dan's family for dinner. We were celebrating multiple events that happened or were happening soon. His cousin just graduated High School, it was Father's Day, and 2 birthdays were coming up. I thought very hard on how to combine all that together. First, I thought, well they all begin with the word "Happy." Next I thought of some symbols that represent each of those events. A tassel for the graduation, a candle for the birthdays and a tie for Father's Day. I wrote around the sides between the different symbols Grad, Father and Birthday for each of the holidays. The cake was chocolate and yellow butter cake and it was covered in Italian Buttercream. Here's another angle where you can see how Laurie draped the tassel down the other side. 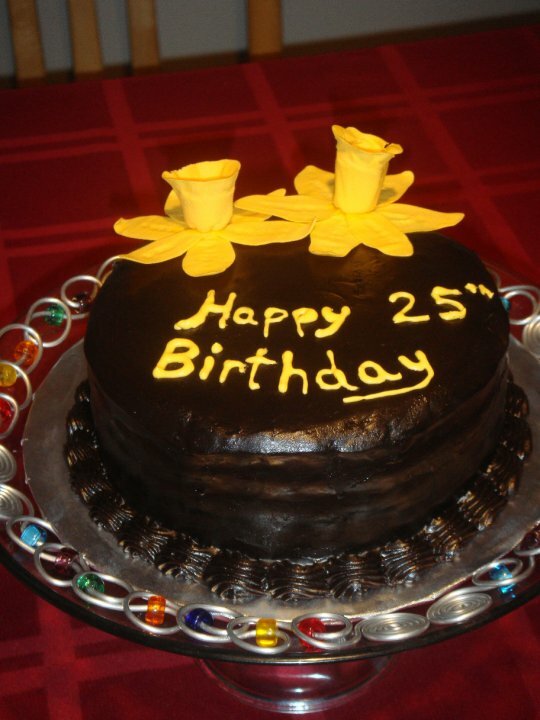 1) Spacing is very difficult when writing along the side of a cake and should be thought of BEFORE you start piping. 2) Execution should be thought about carefully BEFORE you start decorating the cake. This was a cute idea I had to deal with the leftover batter and buttercream. We were going to a family party which I made a cake for, and they have a 2 year old. I thought what would a 2 year old want, the answer was cupcakes of course! Then I had to figure out how to decorate them. When I am trying to get ideas for decorating, I usually pull out books and hunt around on the Internet. I found some cute animals made out of buttercream in one of my books. I decided to try it out. I knew I didn't have all the tips I needed but thought I would try it out anyway. The details were done with royal icing. Chicken cupcake - Dan's personal favorite! 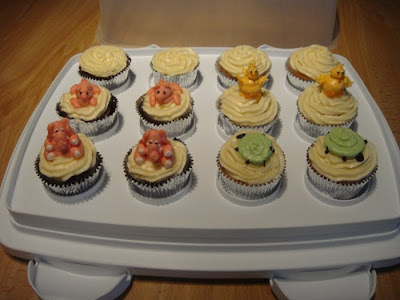 These were pretty easy to make and with Laurie's amazing buttercream and cupcakes, they were not only adorable but also tasted great. My god-daughter thoroughly enjoyed hers (well, the parts that weren't smashed into her face), and all the adults enjoyed them too. I think they'd be great for any young kid's birthday party as a nice addition or alternative to a traditional cake. 1) Never throw out extra batter. You can always make something out of it and get practice decorating. 2) Ideas for decorating can be found in many different places. I made this cake for my younger sister's 25th birthday. She loves banana cake, so I made a banana cake with a fudge icing. My sister's favorite flower is a daffodil. So I tried to make them for the top of the cake. It was the first time making this flower out of gum paste. Unfortunately you can't enjoy the best part of this cake online--the taste! Man, this was so good. It was just an amazingly moist banana cake with this decadent chocolate fudge frosting. It was one of those cakes where everyone asked for a glass of milk when they were done! 1) The fudge frosting sets quickly. I had to use warm water on the spatula to spread the frosting on the cake. 2) Practice, Practice, Practice. That is the only way to get beautiful, life-like flowers. This is the most elaborate cake I have done since finishing culinary school--my first three-tiered cake. It was an Irish-themed birthday cake for my cousin's wife's surprise 50th birthday party. This was for a huge party with 100+ people. Since my cousin was not exactly sure what he wanted. 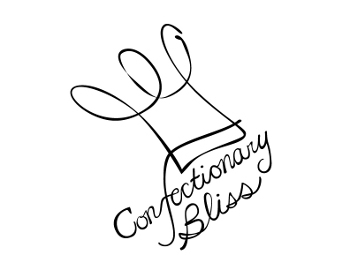 We talked about doing 2 sheet cakes or a tiered cake. We decided on a tiered cake and he wanted it to be elegant. His wife is irish and colors of the party were green and white. From this direction, I drew up my ideas and OK'd it with my cousin who was throwing the party. 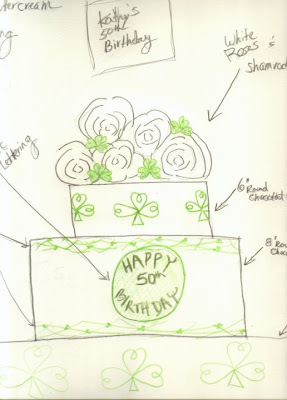 You can see on the sketch (below) that I labeled what each tier was going to be, what the various decorations were, etc. 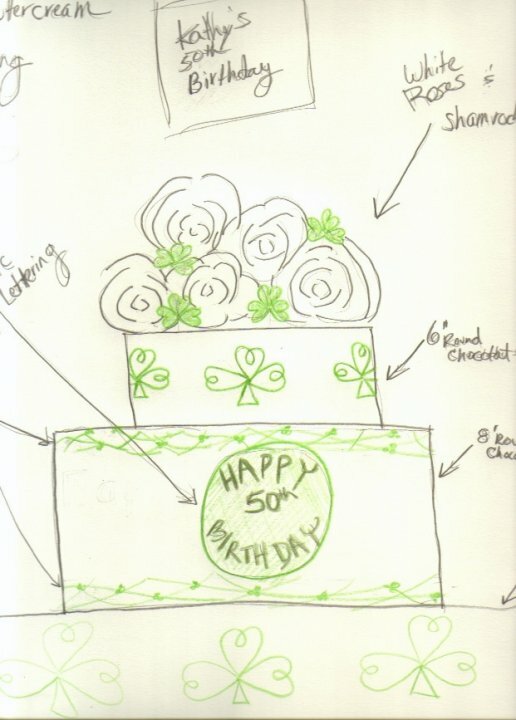 The idea was to top the cake with white roses in a bed of clover, then do some irish patterns and vine-style piping along the lower tiers with little happy birthday logo in a Celtic font. The cake was yellow and chocolate butter cake. 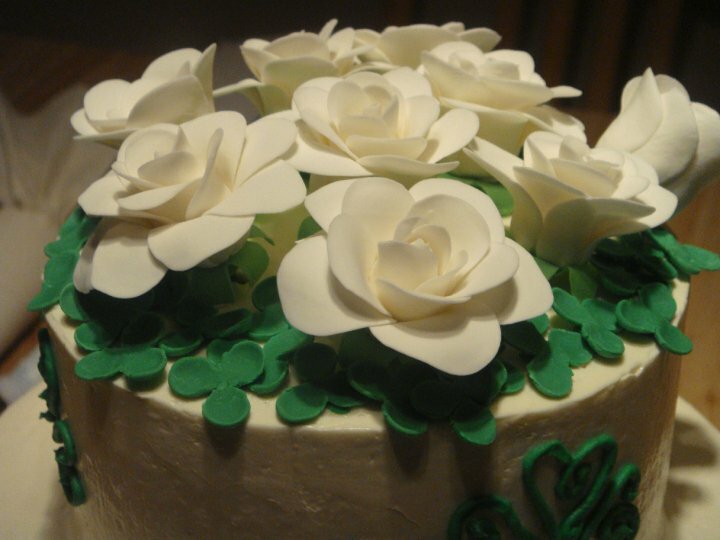 I made all of the flowers and clovers out of gum paste using flower cutters and floral wire. The celtic writing was tricky because the happy birthday "circle" was fairly small. I piped most of the letters with royal icing onto parchment with a print out underneath and then attached them to the gumpaste circle in order to really nail the font style. 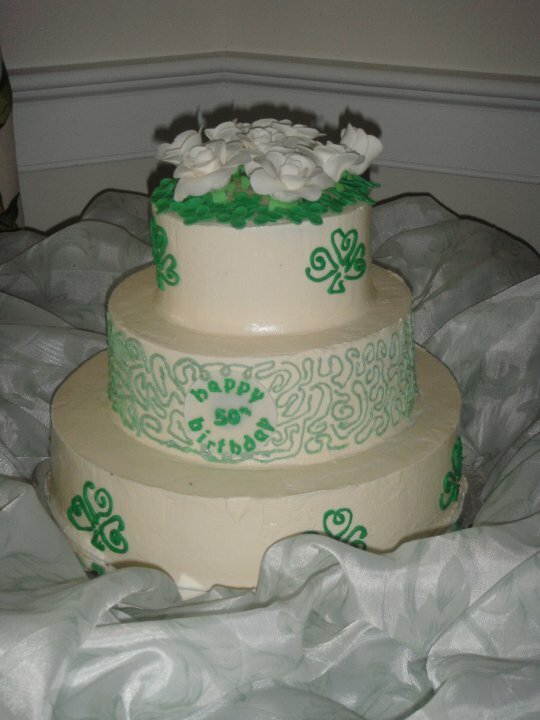 I free-handed the ivy pattern on the tier as well using colored buttercream. The clovers were free piped onto the cake with green royal icing. Here's a look at the final product, on display at the birthday party. There were tiers of vanilla and chocolate. The cake was cut and handed out as a party favor for everyone and everyone gave it rave reviews. 1) Plan out everything you are going to do and don't bite off more than you can handle.